Prime Minister Nguyen Xuan Phuc hailed the strong performance of Vietnam’s wood processing and forestry export and urged relevant agencies to continue working to make Vietnamese wood and wooden products to thrive on the global market at a meeting in Ho Chi Minh City on Wednesday. Vietnam enjoyed a US$3.52 billion trade surplus from exports of wood and wooden products in the first seven months of this year, according to data released at the meeting. Vietnamese-made forestry products also accounted for six percent of the world’s market share, leading the Southeast Asian region and ranking second in Asia, according to Vietnam’s forestry administration. Huynh Van Hanh, chairman of the Handicraft and Wood Industry Association of Ho Chi Minh City (HAWA), assessed that Vietnam’s wood and wooden product exports have maintained a remarkable growth rate in recent times. While it had to import woodworking machinery in the past, the Southeast Asian country is now an exporter of wood processing machines and wood oil to many markets including Bolivia, Myanmar and Cambodia. 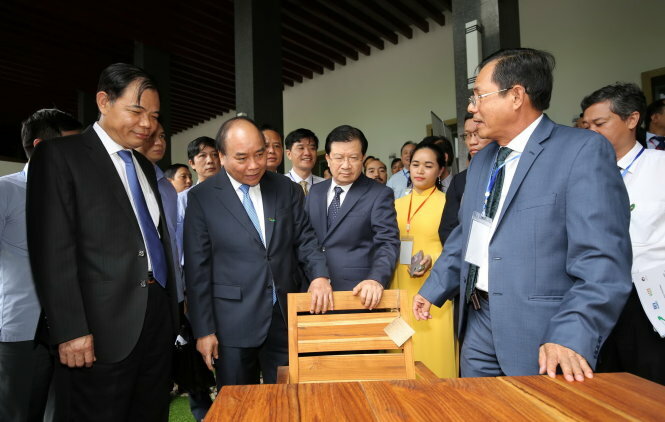 Speaking at the meeting, PM Phuc expressed his pride in the country’s forestry industry, saying that he had recently read an article about Vietnamese wooden furniture being used at world-class hotel chains such as Hilton, Sheraton and Marriot. However, he also pointed out some drawbacks of the industry, including the weak assurance of timber origin, quality of raw materials, limited afforestation and wood processing technology. The head of government also acknowledged the challenge of lacking branded products faced by the industry’s insiders, which makes it difficult for Vietnamese wood and wooden products to compete in the global market. Particularly, 80 percent of Vietnam’s timber products were manufactured according to pre-order specifications and sold to other original equipment manufacturers (OEM), Nguyen Quoc Khanh, chairman of HAWA, said. Khanh emphasized the importance of building a national brand for the timber industry to rapidly expand it in the future. “The question is how to build a national brand for the timber industry so that people around the world will know that Vietnam is the center of timber production,” Khanh said. However, Khanh admitted that the industry needs policy support from the government to achieve such a high goal. In response, the premier underlined that the government would continue to strengthen legal frameworks to create favorable conditions for enterprises operating in the timber and forestry processing and export sectors.